Lady and a List - Get Involved. Make Friends. Enjoy Motherhood. We understand how busy a Mother’s life can be and we want to help!!! 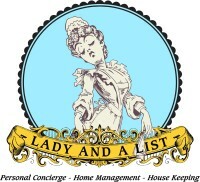 At Lady and a List we offer detailed and affordable house keeping, home and life management services, including Mommy helpers and personal concierge. All services are designed based on your preferences, desired frequency and budget. Organize your life organize your mind. *All MOD Moms members will receive a discounted rate on their services they choose.